Take 42% off the entire course. Just enter code slnichols into the discount code box at checkout at manning.com. 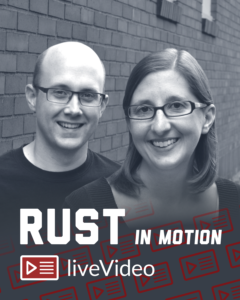 Rust in Motion is an all-access pass to Rust, brought to you by top authorities on the subject. 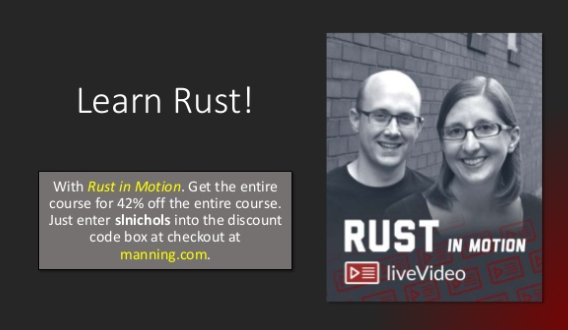 Carol and Jake’s masterful instruction jumpstarts your learning with a spotlight on what’s different and special about Rust! This skilled duo challenges you to dig deeply into the nuts and bolts of variables, primitive data types, functions, control flow constructs, defining enums and structs, and adding behavior to them with methods. You’ll learn memory management via ownership and borrowing, techniques for error handling, lifetime annotations, and other unique Rust concepts. With this liveVideo’s code examples, inspired by real-world scenarios, you’ll be ready to hit the ground running!